The Wobbulator from blair neal on Vimeo. Analog signal in video, as in sound, is a medium all its own – as we saw last week with the gorgeous LZX Industries modules (more on those soon, too). Here are more examples, both sent by reader Blair Neal. The Wobbulator has its own special place in history as a video processor, the product of a collaboration between video artist legend Nam June Paik and video engineer Shuya Abe (a legend of sorts himself). A raster manipulation unit or ‘wobbulator’ is a prepared television which permits a wide variety of treatments to be performed on video images; this is accomplished by the addition of extra yokes to a conventional black and white receiver and by the application of signals derived from audio or function generators on the yokes … The distortions performed on the image result from the actions of audio signals on the yokes. 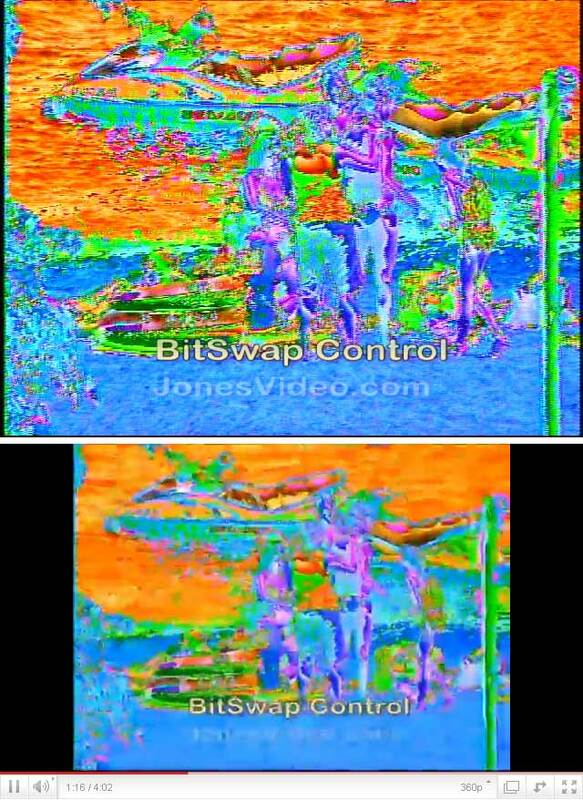 Good image on the top, crap YouTube image on bottom, courtesy the device’s creator. Compress this, suckers! I find it strangely poetic that YouTube can’t capture what it looks like. Maybe that’s a good thing. Jones is also working on a new modular video system, too. Moog, Smith, Buchla, Linn … Jones. Works for me. New name of this site: Create Digital Motion, or Not. Joking aside, in all seriousness, I think you can only appreciate what digital is as a medium if you can appreciate what it isn’t, and that you can only exploit it fully if you understand the potential of analog ways of thinking, too.